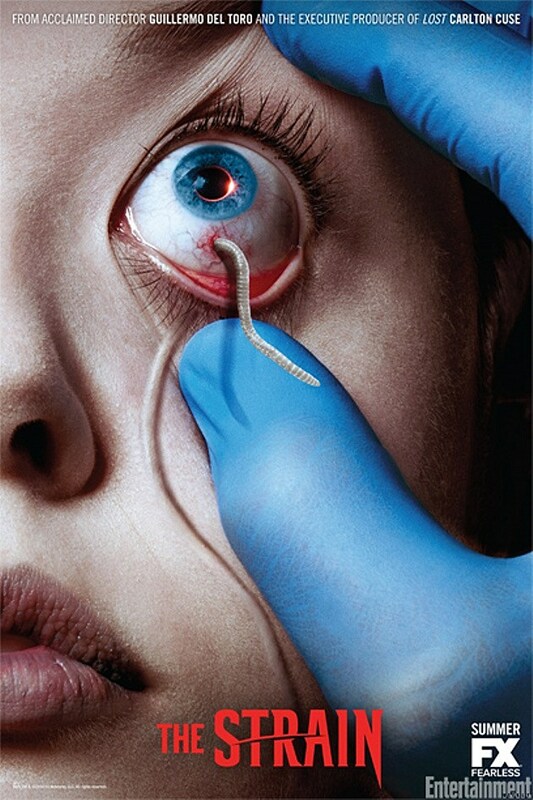 Ripe from the minds of Guillermo del Toro and Chuck Hogan, The Strain thus far is a slow burning thriller whose focus upon the human heart will undoubtedly intrigue viewers. As with the first book this series is based upon, the show starts as an unresponsive Boeing 777 lands at JFK Airport with seemingly dead passengers. Dr. Ephraim Goodweather (the story’s main protagonist) and Dr. Nora Martinez of the CDC are called to investigate. Upon boarding the plane, the two find a flight filled with passengers suffering from an unknown biological malady. The passengers’ eventual release begins the countdown towards the end of humanity — orchestrated by an ancient vampire known as The Master. Much like the original trilogy, the main attraction behind this series is its brutality and reinterpretation of vampirism through biology. The latter is enough to set this series apart from its predecessors. Without revealing too much, victims of this disease experience their bodies corroding in order to establish new organs for feeding. This occurs in a very rapid and Lovecraft-like way, which will disgust viewers, while simultaneously triggering their curiosity. As intriguing as it is, this series is not by any means dependent upon or hurt by traditional horror tropes involving gore. As the story progresses, those who are infected search for, and eventually drain their loved ones. This perversion of affection is driven by The Master’s will. The very idea of love being something worth striving for, yet binding is a concept that’s often used in this show. One scene involving an infected girl returning to her distraught father is particularly haunting. Ultimately, this idea strengthens the image of vampires being a metaphor for the mortality of humanity. Del Toro’s influence upon the cinematography is clear and makes even the most distressing scenes beautiful. As a series that thrives upon a sense of hysteria, his and other’s shooting techniques greatly advances the immersion level. All of the key moments from the first book not only gain more weight for being translated into TV language, but draws alternative responses for the way it’s shot. As any creator knows, too much of any effect might produce an indifferent audience. Because of this, peppered throughout the show are additions of music and humor to add balance. Unfortunately, because of the format of this show, one isn’t given enough time with certain characters. Thus, it is somewhat difficult to understand and even care for said characters (with exceptions such as Abraham Setrakian). Shortly thereafter, the very same characters you wish to see fleshed out more, become outweighed by the strange and creative nature of The Strain’s epidemic. For those who haven’t previously read the book trilogy, this might be enough incentive to give up on the show. That being said, after the first three episodes, character details are exposed that should capture the public’s attention once again. Despite a potential absence for concern at first, and The Master’s ridiculously designed face, del Toro’s and Hogan’s brilliant work so far has found the right home with FX. Prepare for The Strain. Graphic from ScreenCrush. “Insidious: Chapter 2” outdoes the average horror movie and then some. Film director James Wan and scriptwriter Leigh Whannell have created and executed a plot that allows the original story arc to come full circle by explaining some of the freakiest moments from the first movie. they are doomed to feed his appetite. Released Aug. 31, “The Possession” went straight to the top of the box office charts. Now granted, it was the only movie that had nationwide release that week, but with that being said, was it actually good enough to earn that spot? Halloween is all about trick-or-treating, dressing up as your favorite character, eating candy, scaring people or getting spooked and having fun. Events are happening all over campus in celebration of Halloween. Trinkle Hall and RU After Dark are sponsoring two events on Oct. 28. The first is a Zombie Walk, which is a costume parade where participants dress up as zombies and lurch around campus. The event will start at 7:15 p.m. Makeup will begin at 6:30 p.m. in Muse Banquet Hall. The second event is a Zombie Prom, which starts at 8 p.m. in Muse Banquet Hall and goes until midnight. There will be food provided by RU Catering Services, face painting, costumes, a DJ and a photo booth. Zombie Prom. Photo by Austin Tuley. Another Halloween event is RU Otaku-don’s Octoberfest from Oct. 29-30. The event will be held in the Bonnie on the second floor starting at 7 p.m. and concluding at 1 a.m. The club rented out the whole floor for this event. There will be a room for playing horror video games, another room for Japanese horror movies and there will be food in the main lobby. The food will be provided by RU Catering Services. There will also be music for people to enjoy when they aren’t watching a movie or playing a video game. President of Otaku-don Ryan Arias said that he hopes to provide students with a fun and safe harvest festival they can share with friends in an entertaining atmosphere. He mentioned the spooky events like horror movies and scary video games. Costumes are also welcome, but need to be campus appropriate. Prizes such as an iPod charger, glow sticks and headphones will be given for killing the most monsters in a game, not screaming at a movie and best costume awards. The night before Halloween, the Residence Hall Association will sponsor RU Scared. The program was created to give children in the Radford community a chance to come trick-or-treating on campus. On Moffett quad, there will be tables set up where different organizations that will be passing out candy. The residential halls on campus are able to participate as well, and they will have volunteers passing out candy to the children, similar to the typical house-to-house Halloween collection. All of the buildings can participate as long as there are enough volunteers, otherwise participants will be moved into the different quads. RU Scared. Photo by Austin Tuley. Generally 40-60 children come to the event. RU Scared is a way to give back to the community and give children the opportunity to come to campus and go trick-or-treating. On Halloween, the Bowling Club is hosting Spook-n-Bowl. The event will be in the Bonnie Game Room from 7-10 p.m. It will cost $4 to play three games with rental shoes included. The club is expecting about 30-40 people. “The event is to support the bowling club and also just to create an event so students can have fun and relax,” said Bowling Club President Amanda Garland. Halloween decorations will be set up and black lights, laser lights and a fog machine will be used. There will also be candy for students to have while bowling. Prizes will be given out for the best costume. Prizes will be gift cards to Wal-Mart or little prizes from the store.